THE MAN WITH AN ELEPHANT ON HIS HANDS. Words by J. Cheever Goodwin. Music by Woolson Morse. Do what he would to furnish him food, the cry was still "more hay I "
Till he tore his hair, in wild despair, and piped his lachrymal glands. And cursed his lot that ever he got an elephant on his hands. 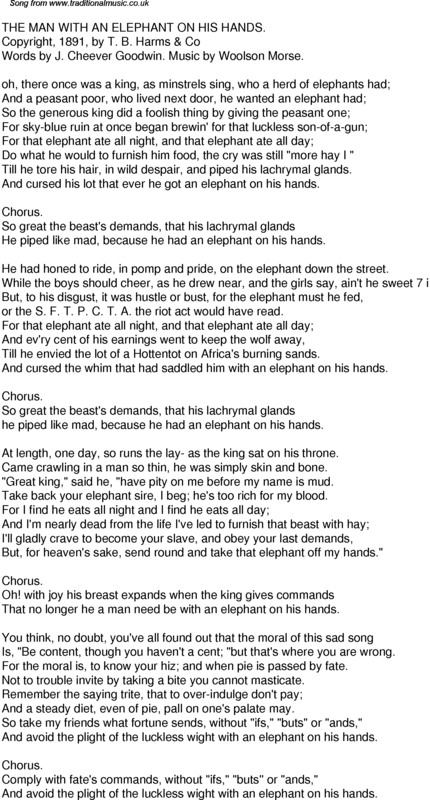 He piped like mad, because he had an elephant on his hands. He had honed to ride, in pomp and pride, on the elephant down the street. or the S. F. T. P. C. T. A. the riot act would have read. Till he envied the lot of a Hottentot on Africa's burning sands. And cursed the whim that had saddled him with an elephant on his hands. At length, one day, so runs the lay- as the king sat on his throne. Came crawling in a man so thin, he was simply skin and bone. "Great king," said he, "have pity on me before my name is mud. Take back your elephant sire, I beg; he's too rich for my blood. But, for heaven's sake, send round and take that elephant off my hands." That no longer he a man need be with an elephant on his hands. Is, "Be content, though you haven't a cent; "but that's where you are wrong. For the moral is, to know your hiz; and when pie is passed by fate. Not to trouble invite by taking a bite you cannot masticate. And a steady diet, even of pie, pall on one's palate may. So take my friends what fortune sends, without "ifs," "buts" or "ands,"
And avoid the plight of the luckless wight with an elephant on his hands. Comply with fate's commands, without "ifs," "buts'' or "ands,"